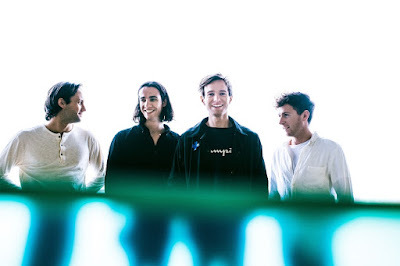 London-based quartet Colouring have shared the brilliant new video for their current single Time, the first single to come from their debut album expected later this year on Interscope / Polydor. Watch it below! Time marks the bands first release since their acclaimed 2017 EP, Heathen. Since then the dapper Leicester born, London-based quartet have spent most of their time putting the finishing touches on their debut album and, as ever, touring relentlessly. Time see’s the band planting their flag firmly in the sand; it’s the sound of frontman Jack Kenworthy coming through the frustrations of writer’s block, bottling his creative claustrophobia and turning it into a Phoenix-inspired joyful indie pop anthem in the slickest way possible. Having already toured with The 1975 and label-mates LANY, they’re no strangers to life on the road and across 2018 are expected to play plenty of headline shows across the globe. It’s already started. This week, they played a terrific headline show at Hoxton Bar & Kitchen to celebrate the release of Time, and to warm them up for their recently announced American tour that will start in May.